As the realization that converting crop lands from food to fuel production probably isn’t such a good idea begins to sink in, more and more non-food crops are investigated. It is interesting that most companies focused on energy plantations work on just some well known crops like Miscanthus, Switchgrass, Poplar or Jatropha. Nevertheless, many of these species have shown that their specific soil and climate conditions are difficult to meet in several regions. Miscanthus for example cannot be produced without irrigation support in Southern Spain where productivity was supposed to be higher than in UK. Switchgrass has demonstrated in North Dakota that climate conditions limit productivity compared to the performance of some novel C3 grasses with summer drought resistance or higher frost tolerance and very low inputs. Much of the ethanol used as a substitute for petrol is currently produced from corn, especially in the US, and has been criticised for driving up grain prices to record levels. A recent inquiry found that laws mandating the addition of biofuels to petrol and diesel had backfired badly and were unethical because biofuel production often violated human rights and damaged the environment. The problem is, how do you get farmers to switch from corn – currently selling for around $7 a bushel – to the much less lucrative switchgrass and other C4 grasses used in creating bio-oil via the process known as pyrolysis? Researchers hope to pull this off by developing a market for the drop-in fuel (defined as a fuel that is compatible with existing engines, pipelines and refineries ) and convincing farmers to use their marginal, less productive lands. But low productivity means low energy balance for most researchers. And low energy balance could derive into high emissions and environmental impact per energy unit (e.g. expressed as CO2 eq per MJ of energy produced). Although, most evidences have been shown that marginal lands can produce feedstock in a highly efficient manner, with lower inputs and higher productivity. Several publications have address this issue and we show below how some unsuspected energy crops, could produce better results compared to best suited known alternatives. The following suggested energy plantations and bioenergy crops, are just some examples of a much longer list. We here just wanted to suggest some energy crops and feedstock production systems a company should consider before starting a bio-project and deciding on best suited alternatives in extensive agricultural lands and up-scaled bio-refinery projects. There are many other possible species and combinations to consider, but we wanted to start with some of the most sound scientific relevant crops that are being developed today. According to an article in Nature, researchers with Michigan State University (MSU) show that marginal lands can serve as prime real estate for meeting alternative energy production goals. By growing mixed-species cellulosic biomass, marginal lands could annually produce up to 5.5 billion gallons of ethanol in the Midwest alone. “Understanding the environmental impact of widespread biofuel production is a major unanswered question in the U.S. and worldwide,” said Ilya Gelfand, lead author of the paper. 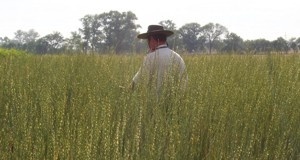 “We estimate that using marginal lands for growing cellulosic biomass crops could provide up to 215 gallons of ethanol per acre with substantial greenhouse gas mitigation.” According to Gelfand, this is the first study to provide an estimate for greenhouse gas benefits, and an assessment of the total potential of these lands to produce significant amounts of biomass. Virginia fanpetals, herbaceous, melliferous perennials, belongs to the mallow family (Malvaceae), and is native to the North America and. 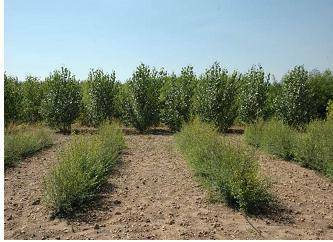 It is not a short rotation woody crop (SRC, SRWC) like both, willow and poplar, or a perennial grass (e.g. miscantus, switch grass) but is instead a soft woody herbaceous energy crop, based on its chemical content and stem structure. This unique species, when harvested in the dry stage, has applications in the bioenergy, insulation and cellulose-paper industries. Different experiences in Spain and Hungary have been demonstrating that a perennial hardy grass can be more sustainable and produce lower costs than other tall grasses when natural resources limit the growth of best suited crops like Miscanthus, Switchgrass, Napier grass or Bamboo. These results have been also confirmed in extremely cold environments like North Dakota in US. Tall wheatgrass (Elymus elongatus subsp. ponticus AKA Elytrigia elongata) produce between 5 and 12 tons per hectare each year, can reach a lifetime of 30 years under certain environments (e.g. Patagonia, Argentina) and has been evaluated as energy crop in several countries. Cynara cardunculus L. is a species native to the Mediterranean region, that is adapted to this particular climate conditions. The species has been cultivated as a vegetable since ancient times according to a rather artificial management system. As a vegetable it is commonly known as cardoon, but as an energy crop it is named just ‘cynara’. The species is a perennial C3 herb with an annual development cycle. As an energy crop, cynara is grown for its aboveground biomass and oilfruits (achenes, like sunflower), that are harvested every year. The establishment of the plantation is carried out from seed in the first year; then it is maintained for several years (>14 years). Many semiarid and subhumid regions can have Cynara as an alternative crop with high potential producing biomass for biofuels, heat and electricity. In Spain the growth cycle of cynara lasts from September-October (plant sprouting) to June (seed ripening). 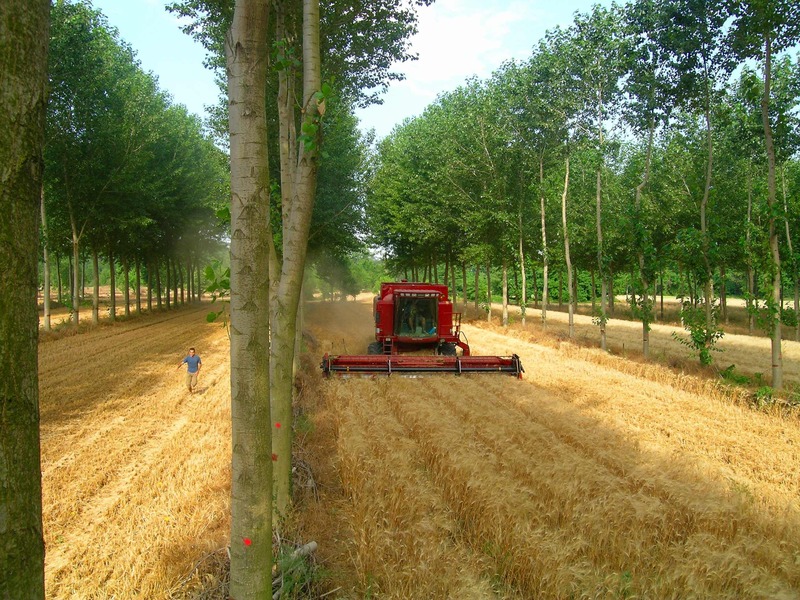 Harvest is carried out in summertime (August-September), once the growth cycle is over and the biomass is fully dried, thanks to the characteristics of the Mediterranean summer (high temperatures and very low rainfall). Later on, and estimulated by the first autumn rainfalls, cynara sprouts from the remnant buds of the plant stock and a new growth cycle starts. Biomass production is closely related to the rainfall of the agricultural season. 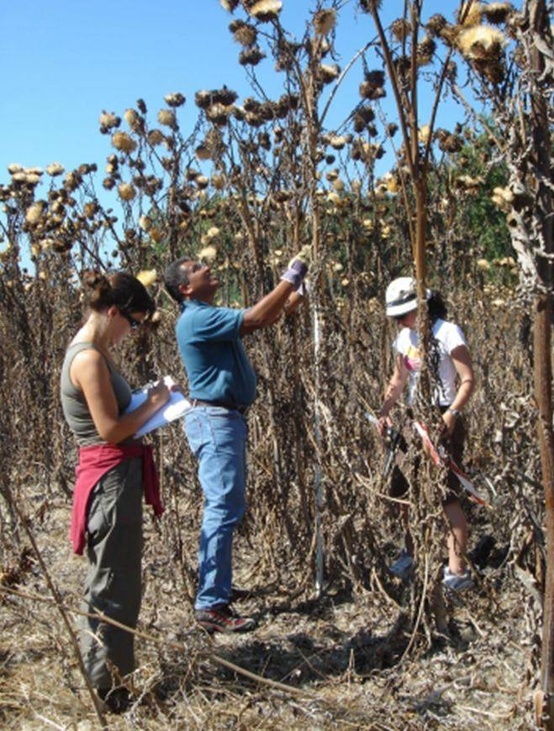 In average conditions (» 450 mm year-1) cynara yields about 14 t dry matter ha-1 year-1, of which nearly 8-10% are oil achenes. The applications of the crop produce are: heating (biomass pellets), power, bio-diesel and paper-pulp, among others. Plants which use crassulacean acid metabolism (CAM), which include the Cacti and Agaves, are of particular interest since they can survive for many months without water and when water is available they use it with an efficiency that can be more than 10 times that of other plants, such as maize, sorghum, miscanthus and switchgrass. 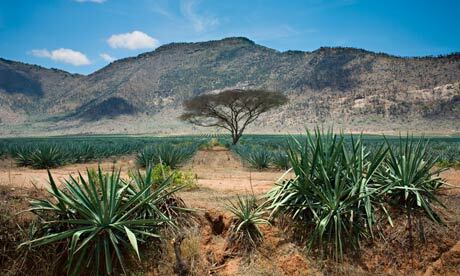 Large areas of the tropics and subtropics are too arid or degraded to support food crops, but Agave species may be suitable for biomass and biofuel production in these regions. The integration between tequila industries, bagasse utilzation and new alternative uses for agaves, could provide excellent results generating several environmental, economic and social benefits. Short rotation forestry is often not viable in many cold and semiarid regions and require from specific woody crops that produce low yields, but have also very low costs. Siberian Elm in demonstration plots in Europe have been showing that enough biomass productivity under rain-fed conditions to be consider as feedstock in large scaled bioenergy projects. That is the case of Siberian elm, a novel woody crop developed in the Mediterranean with high potential for the biomass sector. The species require some development and breeding, and it has already shown enough evidences to be used as feedstock in several areas above 300mm of annual rainfall. Siberian elm (Ulmus pumila) can be a good alternative for biomass production in the Mediterranean areas. Some reports from Spain and Italy trials, in very poor soils have shown that Siberian elm can grow with low inputs, and productions as high as 12 oven dried tons per year where results showed that genetic differences are also very important. The production under rain-fed conditions in the Mediterranean is a limiting factor for poplars, willows and many other species in short rotation coppice (SRC) systems. Eucalyptus in some regions can have higher yields but many disadvantages regarding soil and water impacts have been also reported, while some specific solutions with drought resistant crops could be a possible manner to achieve profitable yields to farmers in areas with few realistic alternatives. Trees play a crucial role in almost all terrestrial ecosystems and provide a range of products and services to rural and urban people. As natural vegetation is cleared for agriculture and other types of development, the benefits that trees provide are best sustained by integrating trees into agriculturally productive landscapes — a practice known as agroforestry. Foto: Nilsson, September 27. Based on www.vanyalandscape.com. Farmers have practised agroforestry for years. Agroforestry focuses on the wide range of working trees grown on farms and in rural landscapes. Among these are fertilizer trees for land regeneration, soil health and food security; fruit trees for nutrition; fodder trees that improve smallholder livestock production; timber and fuelwood trees for shelter and energy; medicinal trees to combat disease; and trees that produce gums, resins or latex products. Many of these trees are multipurpose, providing a range of benefits. In temperate zones, agroforestry systems come increasingly into focus as they offer an approach for the production of fuelwood, thus matching the increasing demand for a self-supply with bioenergy in rural decentralized areas. Because of the large area potential of marginal land, research activities aimed at a reliable estimation of the minimum productivity of fast–growing tree species under most unfavourable site conditions. Additionally, bamboo and many other species like Caliandra could be effective possible energy plantations to consider in agroforestry systems in the tropics. Tree legumes growing even faster (e.g. Sesbania spp.) could also offer high productivity plantations in several regions. Although the pristine natural forest ecosystems represent the largest vegetation and soil C sinks, a considerable extent of this has already been lost especially in the less developed and developing countries of the world. It is unlikely that these degraded and deforested sites will be returned to natural forest cover. The need for transforming some of the lower biomass land uses (such as arable croplands and fallows) to carbon-rich tree based systems such as plantation forests and agroforestry therefore assumes significance. Agroforestry systems (AFS) spread over one billion ha in diverse ecoregions around the world have a special relevance in this respect. These woody perennial-based land use systems have relatively high capacities for capturing and storing atmospheric CO2 in vegetation, soils, and biomass products. According to the Intergovernmental Panel on Climate Change, AFS offer important opportunities of creating synergies between both adaptation and mitigation actions with a technical mitigation potential of 1.1–2.2 Pg C in terrestrial ecosystems over the next 50 years. Additionally, 630 million ha of unproductive croplands and grasslands could be converted to agroforestry representing a C sequestration potential of 0.586 Tg C/yr by 2040 (1 Tg = 1 million tons). Great contribution! You proved the point that there are many ways to make an impact in the biomass world. Diversity and adaptation are key for long term success. I learned quite a bit about energy crops and utilizing marginal lands (soils). What I have read in the past have been mainly critical. More research could benefit the expanded use of biofuels. Biodiversity and utilizing marginal lands and soils is interesting. Utilizing marginal lands to grow selected plants would be an easy sale considering it’s on land that may not be used productively. It also raises other questions. How important are biofuels in developing countries? Would it be possible to lease public lands to(marginal lands) and stay profitable? Well, I am not sure Banana will let more covered the soil compared to grasses. The cuttings as many other crops with potential use in marginal lands (shrubs or even short rotation coppice and forestry) let some biomass (about 1 to 2 dried tons per ha per year) as they remain on the field after harvesting (harvest efficiency is about 75-90%). Banana’s cropping systems can be produced in very good and fertile lands and the opportunities for those involved in Banana’s production will be always to grow them for food. I believe some residues in the industry could be interesting to be used but I would promote lignocellulosic crops in those areas (like Napier grass and many other alternatives). Good effort, however Asia (Indo-Pak subcontinent) is not covered fully and fact is that here there is more scarcity of fuel & technology but energy demand is tremendously increasing. A further study is required regarding solar plants & availability of raw material for pv cells or reflecting mirrors. Great job! However what ever the crop is the end users and suppliers have to understand exact location, accessability, quality and quantity features of any crop daily basis to make supplies economically sustainable and working smoothly. New operational business practices and models should be implemented based on utilization of novel and easy-to-use IT solutions too. Otherwise financials may be a surprise. Thanks for every other informative web site. The place else may just I get that kind of info written in such an ideal manner? I have a challenge that I’m just now operating on, and I’ve been at the glance out for such info. I love reading an artcle that can make men and women think. The agroforestry area might grow considerably when lignine can be valorised properly. Great Job! But every county have specific crops for energy? not only specific species but different crop management and even combinations of different crops. Moreover, there are sinergies between food (including forages), wood, biomaterials and energy outcomes. Biomass gives flexibility and lower risk with additional land valorization and new business development. Arturo, you’re the best! You will change forever the marginal lands a d deserts! Great job!